Being a mother is a constant work in progess. Some days you have all the answers and some days the answer do not work at all. My first pregnancy was quite a bit rough and I definitely was not the stereotypical glowing mother-to-be. On top of all the physical ailments, I was on a emotional rollercoaster that I could not seem to get off. 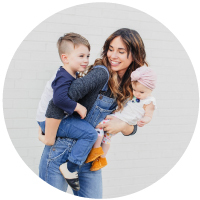 I always knew that I was meant to be a mother, it was just so disappointing to find out that my pregnancy dream was the not the storybook one I had always imagined. Having my own business, I was also working nonstop right up until the birth of my son, Jaxson. After Jaxson was born, I began to realize that something was still not right with me. I had never thought I would be the one who would come face to face with postpartum depression. It was rearing it's ugly head at me and I couldn't shake it. I finally had to come to terms with it and took all the correct procedures to fight back. It was exactly around six months where I realized that I won the battle and that I was starting to feel like myself again. Going outside to feel the sunshine on my face was actually a wanted reality and not a dreaded thing my husband was begging me to do every other day. The connection that my son and I had was amazing. In time, Jaxson helped bring me to life and assured me in his smiles that I was good enough to be his mother. In the beginning, the fear of failing him somehow would overwhelm my mind and sometimes keep me up at night as I stared at his little face while he slept. Every cry had to have an answer for me and when I couldn't find one, I felt frustrated. No one tells you that time heals those things and that you may not need to google every question to find the answer. That sometimes the answer is really within yourself and that you..yes..you..may be able to solve the problem on your own with no help at all. I finally got the memo at six moths with Jaxson. The moment the light bulb went off in my head I realized that I was never going to turn back and went full force into trusting myself and my partner and just taking things day by day. Then, I became pregnant again! I must say I was a wreck all over again during my second pregnancy, except this time it was mostly physical and not as much emotional. The second time around, I was able to see the signs of falling into the emotion rollercoaster and I did all I could to try avoid getting on the ride at all. I took time off of work and took time to myself and really relished in welcoming this little girl to our family. I was nervous about the new addition breaking up what we..what I had worked so hard on for so long. I wasn't quite sure what to expect as I had heard so many horror stories of sibling rivalry and jealousy. However, this time around , I didn't google the answer. I just trusted myself and my husband that we would find the answers that we needed when the time arrived. I spent so much amazing quality time with Jaxson before Owen arrived. Although, I was sentimental about him losing his title of "only child," I was so excited that he was gaining the title of "big brother." We all worked together as a well oiled machine. There was no better time for us to welcome a new addition, and we were all so excited about it. The day that Owen arrived was a magical one. I had decided that I did not want Jaxson at the hospital. We had decided that we would spend some quality time with Owen in the hospital, and really get acquainted with this little being we had waited to so long to meet. This is something that I had lacked in doing with Jaxson, as I was consumed with visitation and exhaustion, that the first couple of days with him were such a blur. I needed to make the change right away, in the beginning, and I am so glad I did. I loved on her so hard and brought her home to her brother on the third day of her entrance into the world. When Jaxson met Owen, that moment changed my life forever. It literally brings me to tears to even think about. We had the perfect family and everything was in it's right place. That postpartum depression didn't rear it's ugly head, and I was out in the sunshine everyday and have been since. Like I said the in the beginning, being a mother is a constant work in progress, and some days you have all the answers and some days the answer do not work at all. However, I know now that the true answers are really all within you and have been all the long. You can find them there in this vast landscape of your heart. I really enjoyed this, thanks for sharing. You have a beautiful family!